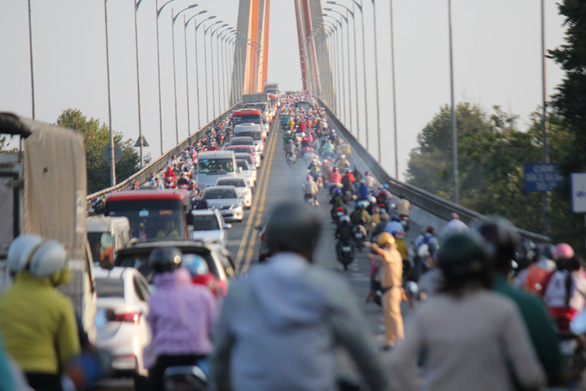 -- Rach Mieu Bridge, which lies along a major route connecting Ho Chi Minh City and provinces in Vietnam’s Mekong Delta, was heavily congested on Saturday afternoon as people started returning to the southern metropolis at the end of the Lunar New Year (Tet) holiday. -- An average of 20 people was killed in traffic crashes every day from February 2 to 9, decreasing by eight people compared to the same period of last year, according to the National Committee for Traffic Safety. -- Authorities in the north-central province of Nghe An have worked with a car driver after he slammed his vehicle into the boom barrier of a tollgate at Ben Thuy 2 Bridge on Saturday afternoon. -- A local travel agent has recently uploaded a viral post on social media after their group of Malaysian tourists were charged VND500,000 (US$21.5) for a dish of stir-fried eggs and tomatoes at a restaurant in Nha Trang, a famous beach city in south-central Khanh Hoa Province, on February 7, the third day of the Lunar New Year fest. Local authorities have inspected the venue following the incident. -- Tran Van Tuan, 36, a resident in the southern province of Dong Nai, on Saturday arrived at the home of 21-year-old Nguyen Thi Thuy Tien to express his apology after he had slapped Tien following a minor traffic accident earlier this week. Footage of Tuan’s violent act had previously become viral on social media since February 6 and sparked outrage among viewers. -- A 45-year-old man has allegedly murdered his wife and another woman before attempting to kill himself by jumping off a bridge in the Mekong Delta province of Ben Tre. -- Police in the Central Highlands province of Gia Lai confirmed on Saturday they had received multiple reports of passenger buses being stoned along a local street on Friday night. -- A resident at an apartment complex in District 7, Ho Chi Minh City has reported having a smartphone and laptop worth nearly VND100 million ($4,300) stolen by her maid on Friday. The victim said she hired the suspect to substitute her regular housekeeper who had returned home for the Lunar New Year holiday. -- Many visitors to Da Lat, located in the Central Highlands province of Lam Dong, had to set up tents along the iconic Xuan Huong Lake on Friday night as local hotels were fully booked due to high demand during Tet.